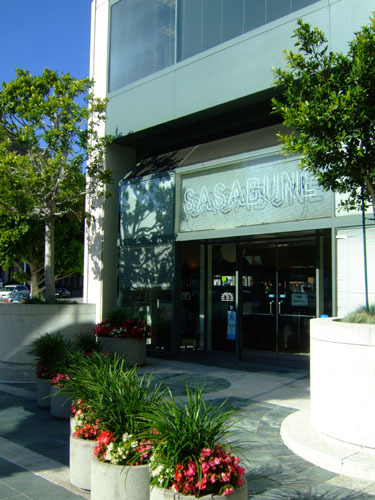 Ah Sasabune, arguably LA's most famous sushi restaurant. I had heard a lot of good things about the place, though Sasabune certainly has its share of detractors (most complaints seem to center around oversaucing and warm rice), and had always wanted to get around to trying it. Nestled on the bottom floor of an office building, the exterior is rather unremarkable. 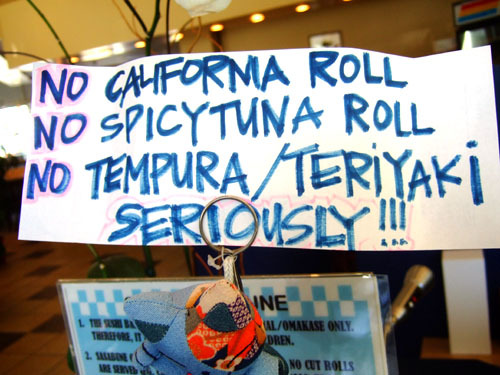 Upon entering, you receive a stern warning: no "Americanized" sushi here! 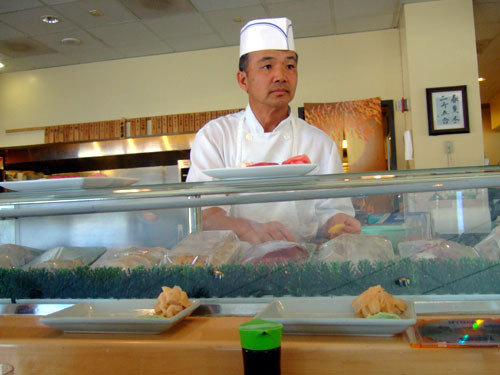 Owner Nobi Kusuhara is a disciple of the Nozawa (aka "the sushi Nazi") school of sushi, so this is to be expected. The space used to house a Todai (shudder), so unfortunately, the decor leaves much to be desired. The place is large, and thus feels a bit cavernous and cold. The best place is still at the bar, in front of Nobi-san. 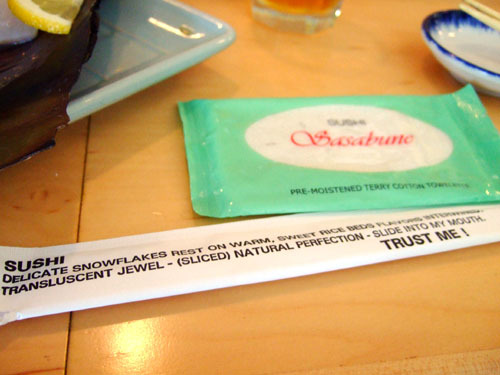 Sasabune has its own customized wet naps and chopsticks. Cute. 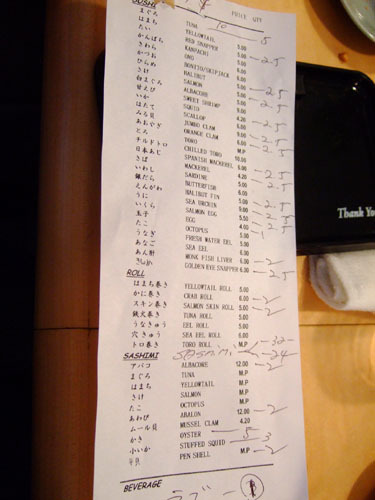 The sushi menu. 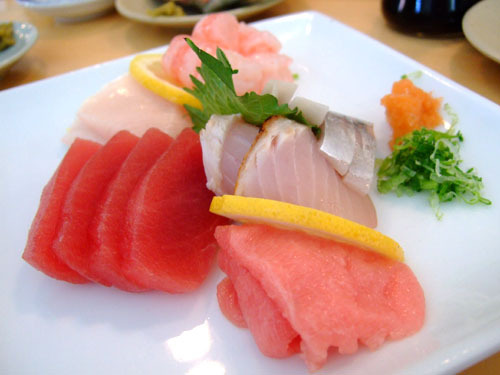 Sasabune has a nice selection of fish at surprisingly reasonable prices. 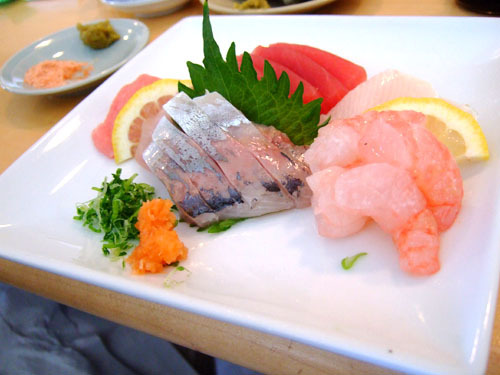 Some of the items such as sardine and ono aren't seen offered at many restaurants. Click for a larger version. I brought a bottle of 1990 Krug Brut Champagne to drink with the meal. It was quite intense, with mild citrus flavors on the nose leading to mass amounts of toast and yeast on a long, lingering finish. It was my most intense Champagne experience ever. 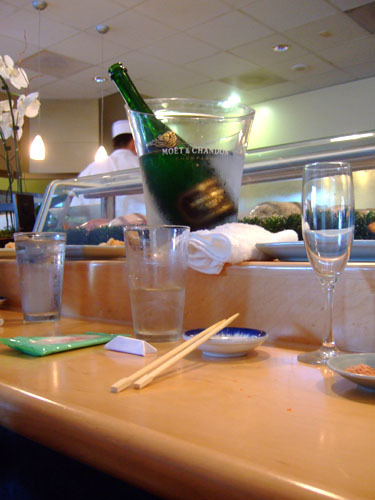 On a side note, the waitress holding the bottle is also a waitress at Urasawa (where I'd been the previous night). She mentioned to me she had two jobs, but I didn't know the other was here! Small world eh? This was my first experience with pen shell, a large saltwater clam. 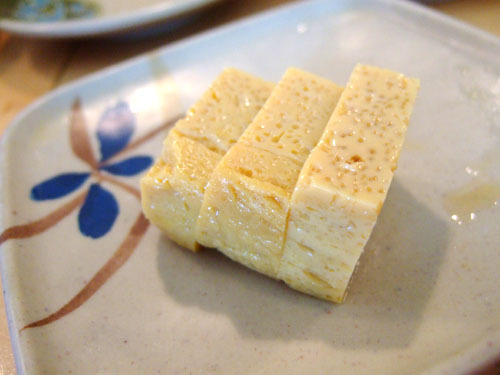 It was very crisp and fresh tasting, with a texture reminiscent of a cross between awabi, mirugai, and hotate. The taste itself was quite mild, so it was served with Hawaiian salt and yuzu kosho (yuzu, chili pepper, salt), but I thought the clam easily stood on its own. The flesh had a great texture near the center but the edges were very tough and crunchy. The flavor was mild, with a slight sweetness to it. Nice, though not as strong as I've had at Go's Mart. 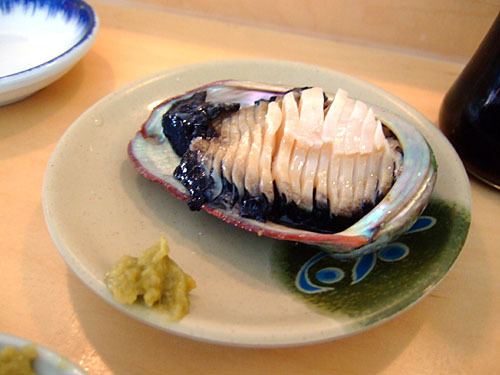 While we were eating, Nobi-san also told us about the various types of abalone available: black, white, red, and pink. What we had was red, the largest and most common variety. I believe he also said that the pink's were the best, though they're mildly endangered and thus illegal to harvest. 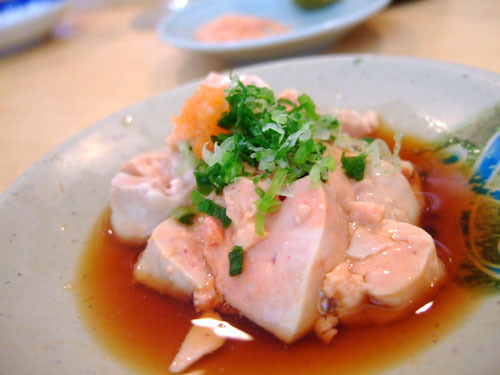 Albacore in ponzu sauce, with scallions. I didn't find the ponzu too obtrusive here, but I understand how others could. This fish's flavor didn't exactly take center stage, but nevertheless, I thought the dish was still rather tasty. 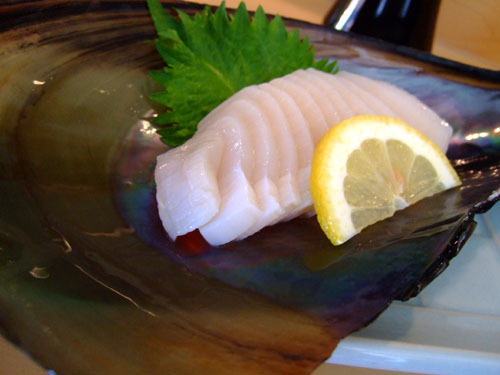 Ever since having them at Water Grill, Kumamotos have been my favorite type of oyster. These did not disappoint. 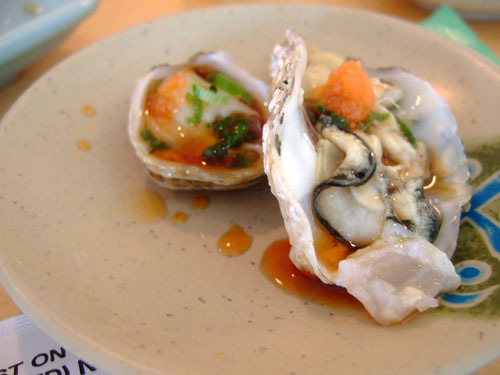 The oysters' clean, crisp taste was further heightened by the citrusy sauce and momiji oroshi. Excellent. The sashimi here were: amaebi (a rather unusual consistency, it was crisper than what I expected, but not creamy), hamachi (perhaps a bit less fatty than usual), maguro (very lean, had a hard time discerning much flavor here), sawara (milder than the aji), aji (quite fishy on its own but very good when sauced), and toro (not particularly fatty or oily). 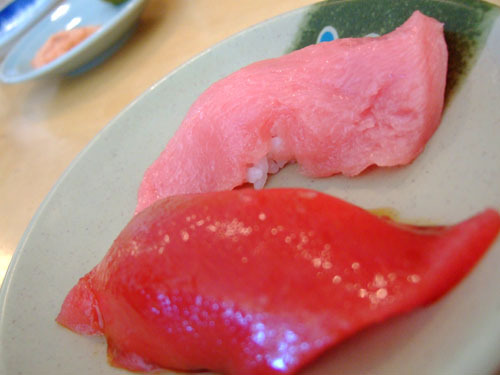 These two pieces of tuna were very similar to the sashimi slices above. The toro was rather unspectacular. 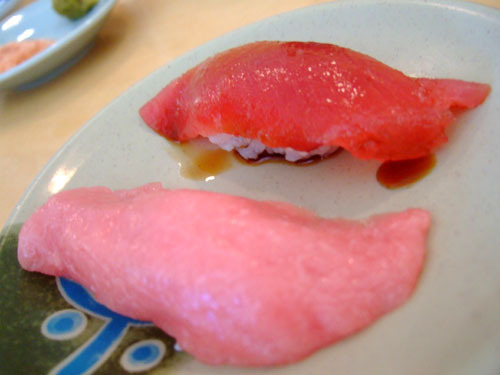 The maguro was extremely mild, and thus really needed the soy sauce to draw out the flavors. 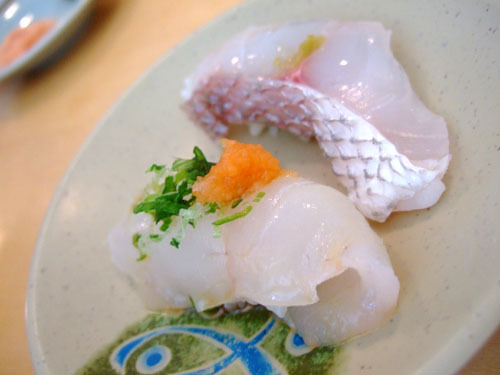 The snapper, served with a touch of yuzu kosho, was quite delicious, and I appreciated the bit of skin left on the fish. I also enjoyed the hirame, topped with ponzu, scallion, and momiji oroshi; the garnishes piqued the palate and really drew out the subtle flavors of the whitefish. 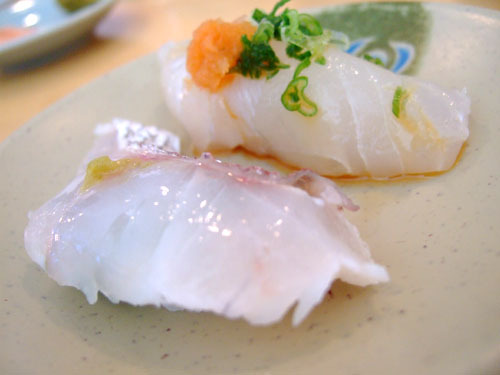 Kinmeidai is something I may not have had before; it's known as "golden eye snapper." Here, it came topped with ponzu, scallion, and what I think is grated ginger. 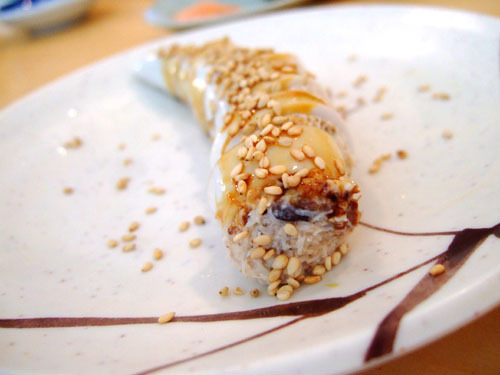 Compared to regular tai, I thought it was perhaps a touch sweeter, and with a softer texture. Very nice. 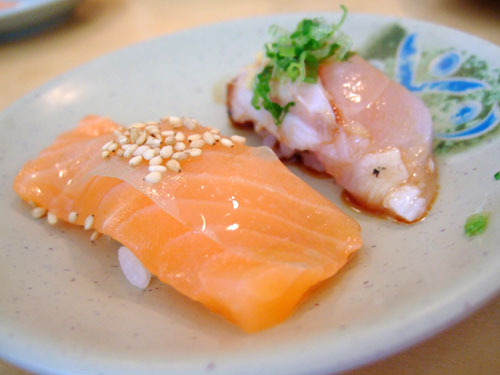 The salmon here came with sesame seeds and battera kombu (pickled kelp). The fish could've stood on its own, but I did like the tartness and texture that the kelp added. 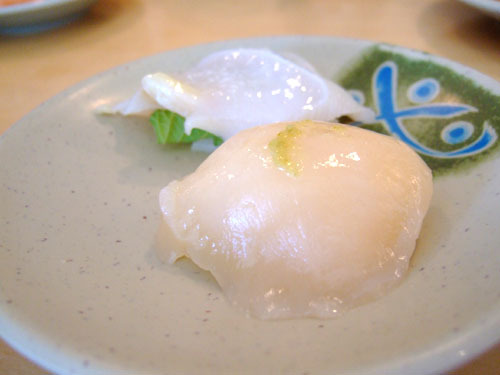 The scallop, topped with a bit of yuzu kosho, displayed typical, pleasing scallop taste and consistency. 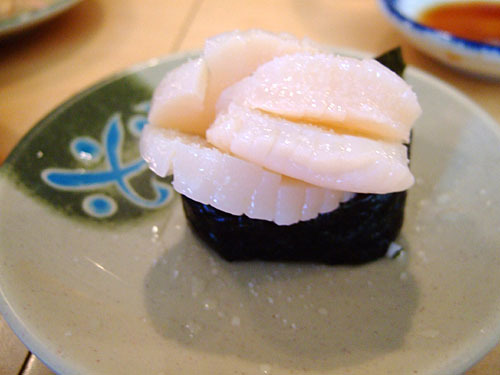 It sort of reminded me of the scallop I had at Wakasan. Texture-wise, the geoduck was quite similar to the version I had at Urasawa the night earlier; the flavor, however, was not as pronounced and the shiso tended to dominate. 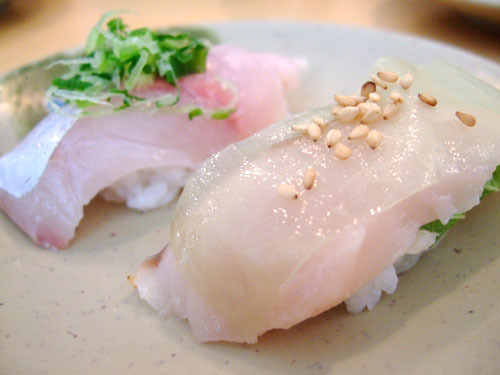 Like the salmon, the mackerel came topped with sesame and battera kombu; however, it also had a slice of shiso inserted between the fish and the rice. These accoutrements did a fine job of tempering the oiler, rougher taste of this Norwegian mackerel. 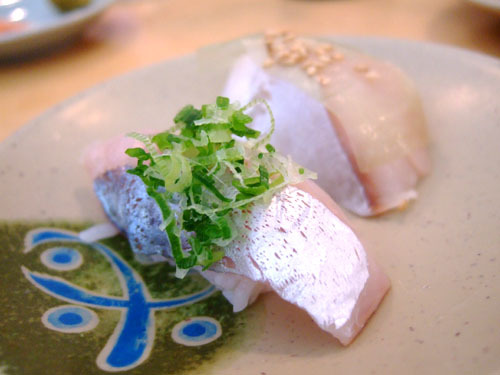 We also had Spanish mackerel, topped with scallion. This was a fine, prototypical example of the fish, and was quite tasty. Egg with egg. 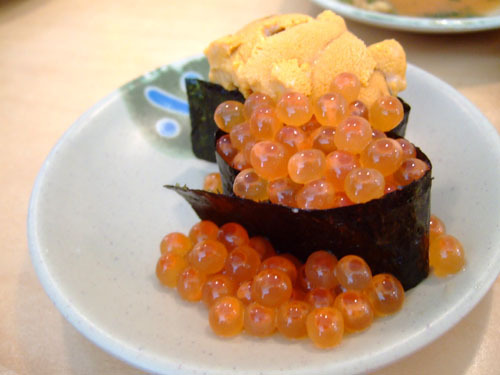 I thought the salmon roe was creamier than usual, with less pop and brininess than typically found. 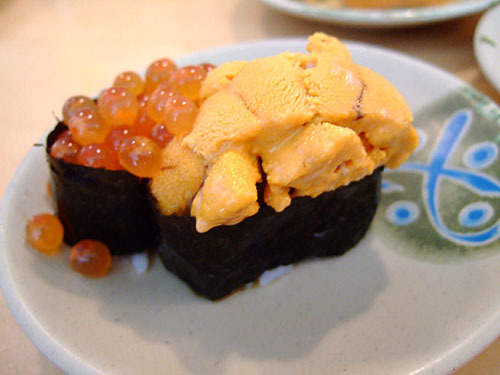 The uni, from Santa Barbara I believe, had nice texture and a clean, mild taste that gave just hints of the ocean. According to Nobi-san, this was Sasabune's "answer to French Laundry." Actually, I think I prefer it to the lobster I had there. 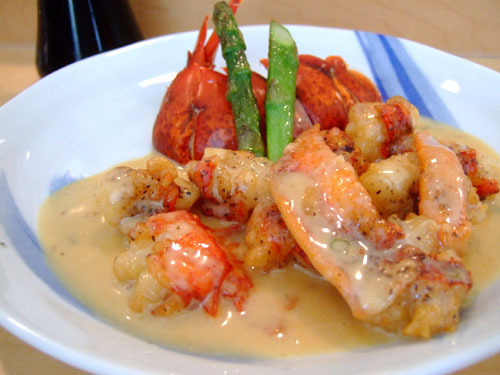 The consistency was just right, while the sauce's sweetness highlighted the lobster's natural flavor. We shared this amongst five people, but I would've liked to have had the whole thing! 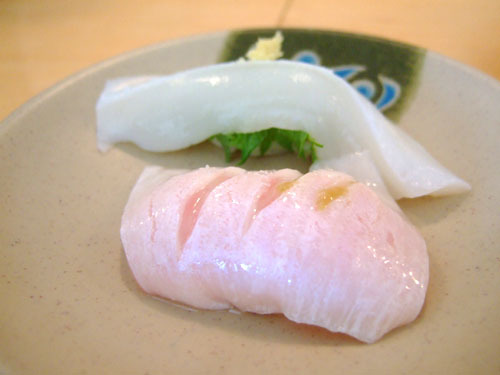 Engawa is actually halibut fin muscle. It's pretty difficult to find and I think I've only had it once before, at the old Abe on Newport peninsula. 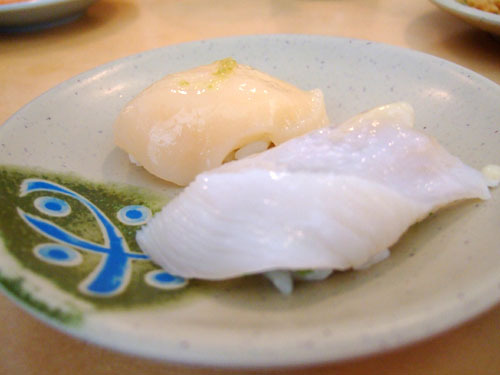 The flesh was very tough and chewy, which was expected since the muscle is a very active part of the fish. 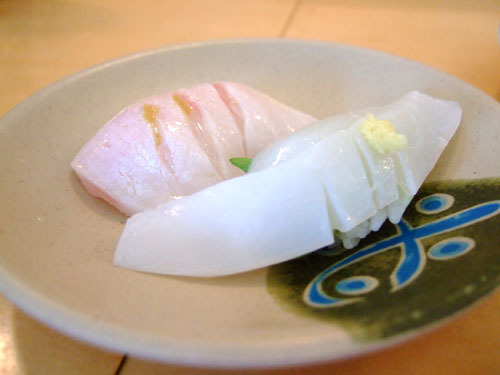 The squid was served with shiso, which turned out to be the dominant flavor here. Its texture was more crunchy than creamy. Texture-wise, there was a clear contrast between the chewy squid and the soft crab. It was quite interesting and something that I'd never really had before. 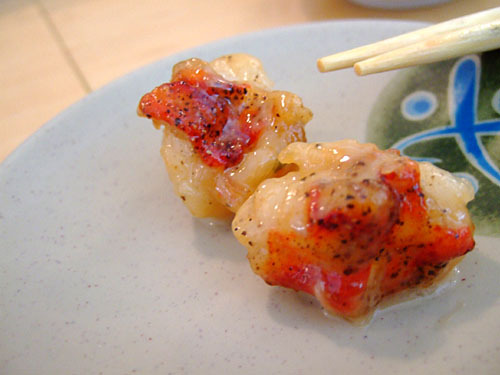 In terms of taste, the squid itself didn't have much of it, so the crab clearly dominated. 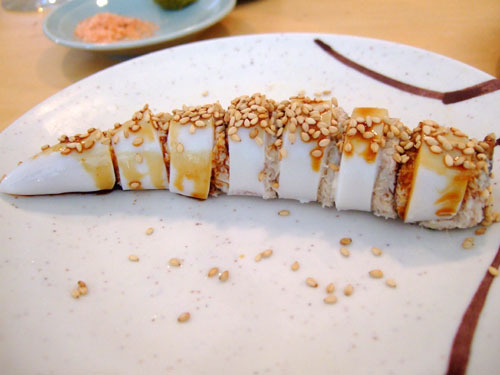 The addition of sesame actually added a nice flavor element. 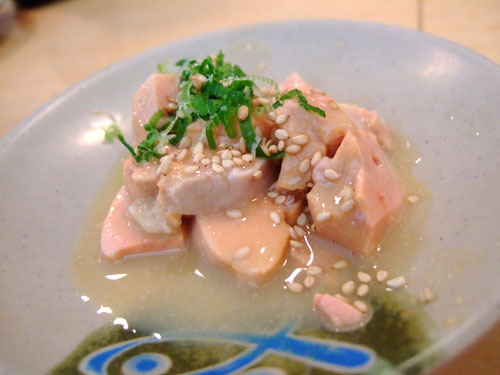 Monkfish liver, topped with sesame, momiji oroshi, and scallion, came served in two sauces, one miso and one ponzu. 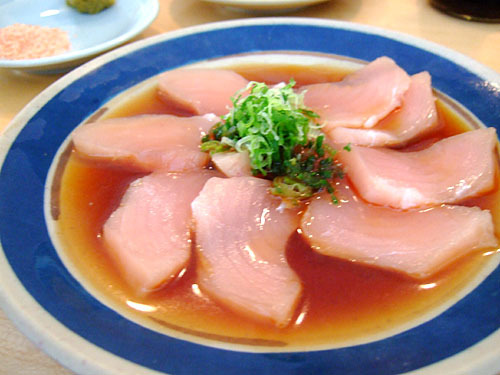 I preferred the miso, as the ponzu was a bit too tart for the mild flavor of the liver. 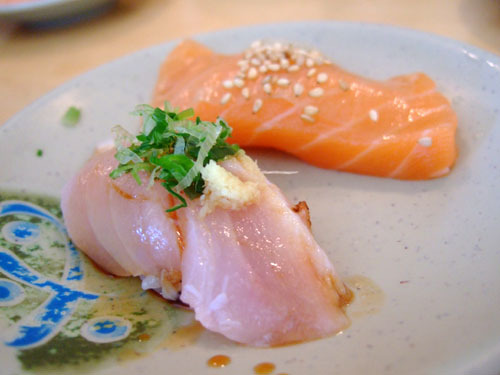 I would've liked a firmer consistency to the ankimo though. Orange clam. Crisp and subtle, with an almost gritty texture. 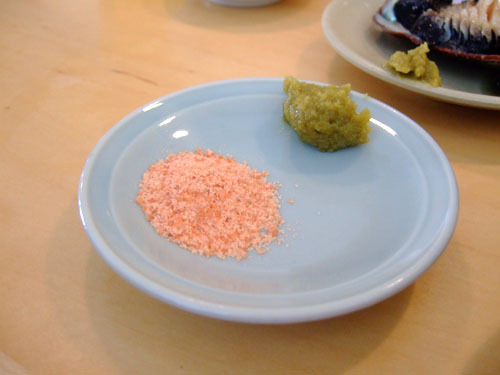 It came sprinkled with a touch of salt to draw out the natural flavor. An interesting consistency, wet and dense, but a touch too sweet for me. The carrots added a crisp texture contrast, while the scallion and hanakatsuo presented subtle flavor complements. Nice. 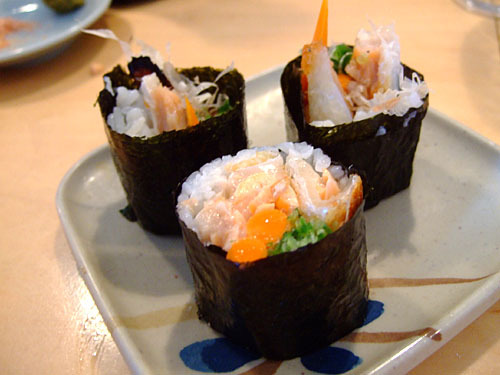 One of Sasabune's signature dishes is the blue crab hand roll. 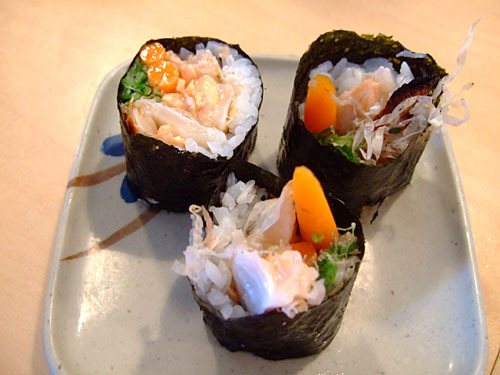 This is the crab, minus the rice and nori; it was also used in the squid roll above. 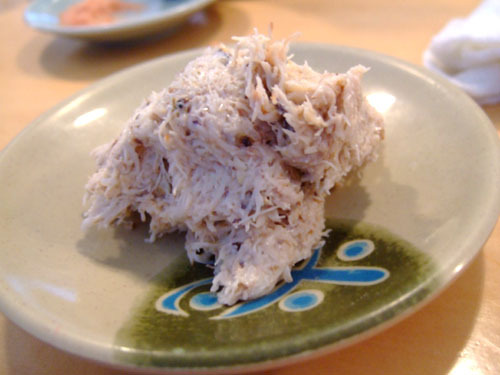 It was an extremely pure and intense expression, and really captured the essence of blue crab. 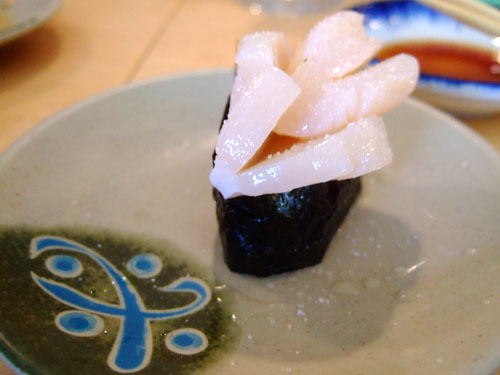 But going back to the hand roll, I had an identical dish at Sushi Wasabi in Tustin. It turns out that the owner, Aoyagi-san, used to work with with Nobi-san. 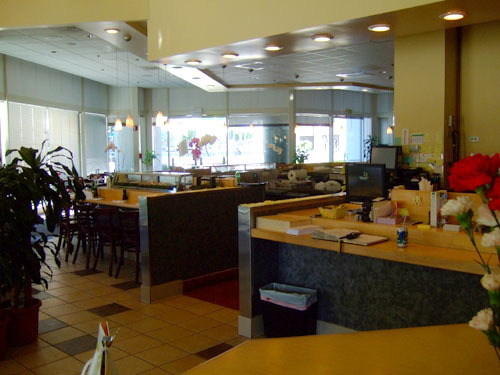 That certainly explains the similarity in the food, so if you like Sasabune, give Sushi Wasabi a shot if you're down in Orange County. To sum things up, I didn't have a problem with the sauces or the warm rice. Even the pre-cut fish wasn't that big a deal. And for the most part, the quality of food is right up there. In fact, I had some fantastic dishes. It's the loss of intimacy and personal interaction that irks me. We were fortunate enough to be sitting in front of Nobi-san, and had a very pleasant rapport with him; he seems like a genuinely good guy. This interaction, I think, is a key part of the experience, and unfortunately that's something most of Sasabune's customers just simply can't partake in. gotta try this place. thanks.. so, how much was the bill? Unfortunately I don't recall the exact amount, but I believe it was in the low $100's. I've been curious to try SASABUNE since it's more in my budget, but I was told SUSHI ZO in Culver City is way better, although a bit more in price. Have you heard of that place before and will you be adding it to your restaurant route?